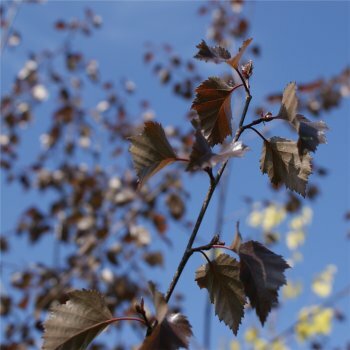 Betula pendula 'Pupurea', more commonly known as Purple Birch, is slightly less weeping in habit compared to other birch trees but still displays the typical silvery white bark, contrasting beautifully with rich, dark foliage making this variety an ideal feature tree. The serrated foliage emerges dark purple/red in spring then slowly turns to purple/dark green throughout the summer and finally bronze/purple tones appear in autumn. Young branches are also a deep purple and catkins appear in the spring. This tree can be grown on most soils but it’s best to avoid very chalky soil. Betula Pupurea is slower growing than other birches but will still reach a height and spread of 6 x 3 metres in 20 years. Our pot grown Weeping Purple Birch trees can be planted at any time of the year. Start by removing weeds and grass within a metre of your desired planting hole. Dig a square hole as deep as your root mass and approximately 2x as wide. To help the tree establish more effectively, sprinkle root grow in the hole. Remove the pot, gently loosen the roots and place into the planting hole. Mix 50% of the original soil with 50% compost, fill in the hole and firm around gently. Avoid banking the soil up around the collar of the tree. Unless it's a multi stem form, we recommend planting Purple Birch trees with a stake and tie kit to ensure the roots are well anchored - instructions are in the planting guide. Established Weeping Purple Birch trees do not require pruning and they do not take well to hard pruning. Hard pruning increases light penetration which in turn results in increased soil temperature and decreased moisture levels. Simply remove the lateral shoots to maintain a clear trunk and prune any diseased or damaged branches. Pruning should be carried out in late summer to mid-winter. Purple Birch trees bleed heavily at all other times of the year, especially late winter.